The carbohydrates in honeydew, a type of melon, will elevate your blood sugar levels. As a general rule, any food or drink that contains more than 5 grams of carbohydrate per serving will affect your blood glucose. A serving of honeydew contains about 15 grams of carbohydrate. Honeydew contains two types of carbohydrate -- sugar and fiber -- but no starch. Honeydew, a good source of potassium, also provides vitamins A and C. A single serving of honeydew -- about 1 cup of diced melon -- contains 15.45 grams of total carbohydrate. Total carbohydrate includes all of the sugar, starch and fiber content in any given food or beverage. One cup of diced honeydew contains about 14 grams of total sugar and 1.4 grams of fiber. Sugar and starch carbohydrates both elevate your blood glucose levels, but fiber does not. During digestion, sugar and starch are converted into glucose, which enters your bloodstream, causing an increase in your blood glucose levels. Fiber does not get broken down into glucose. Instead, it passes through your body undigested. When your body digests honeydew, all of the sugar -- sucrose and fructose -- is broken down into individual molecules of glucose, the simplest form of sugar. 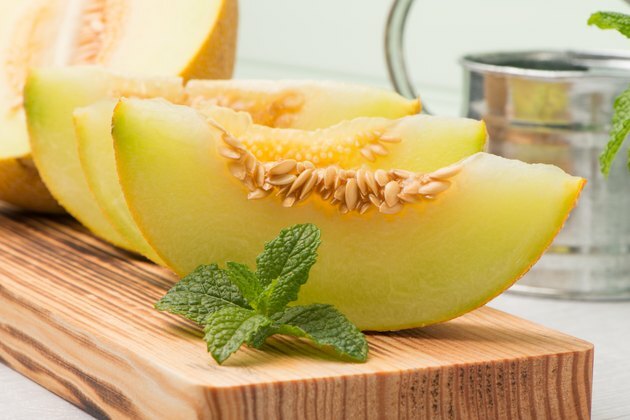 After you consume honeydew, the food matter makes its way to your stomach for digestion. During the process of digestion, the sugar carbohydrates in honeydew are broken down into glucose. The glucose molecules go through the lining of your small intestine and enter your bloodstream, causing your blood sugar levels to rise. Although honeydew provides important nutrition, it will elevate your blood glucose levels more than many fruits. The American Diabetes Association reports that honeydew melon falls into a medium glycemic index category, and they recommend you enjoy it. Raspberries, for example, contain less than half as much sugar -- 6 grams -- and nearly six times as much fiber -- 8 grams -- per 1-cup serving. Other good, fiber-rich fruit choices include bananas, apples and pears with skin, blueberries and oranges. Carbohydrates are your body's main source of energy. Carbohydrates supply your body with glucose, which your cells require to function properly. About 45 to 65 percent of your total daily caloric intake should come from carbohydrates. This means that based on a 2,000-calorie diet, you should consume between 225 grams and 325 grams of total carbohydrate daily. Fruit, a nutrient-dense carbohydrate, is an important part of a healthy and balanced diet. In general, most adults should consume between 1-1/2 cups and 2 cups of fruit per day.